All Aboard the Funtime Express! 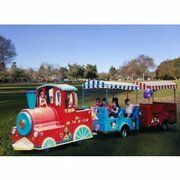 Renting a Trackless Train for your event will bring hours of fun and entertainment. The gas-powered outdoor train can drive on asphalt, cement and grass. Accommodates 4 riders at a time. Raising money for your event, consider adding a Trackless Train to generate income at the event by charging per-ride. Trackless Trains are also a great way to bring in the Easter Bunny or Santa Claus. Trackless Train rentals are very diverse - call today to learn more today about a Utah Trackless Train Rental. Trackless Train. Attendant Required. Gas Powered, Outdoor Only.